The number of SVOD subscribers in Latin America is set to more than double between 2017 and 2023, according to Digital TV Research stats. The report predicts that the number of subscription video-on-demand subscribers across 19 countries will increase from 21.14 million at the end of 2017 to 48.24 million by 2023. “By 2023, 28.4% of the region’s TV households will pay for an SVOD package, up from 13.2% by end-2017,” said Simon Murray, principal analyst at Digital TV Research. Mexico is tipped to become the SVOD leader in 2019 and account for 36% of the region’s overall subscribers by 2023. Brazil, which has a larger population, is expected to account for a further 27%. By 2023, Puerto Rico and Mexico are tipped to have the highest SVOD penetration in the region with uptake of 53.5% and 51.8% respectively. “These two countries are the only ones in the region where Amazon Prime operates,” says Murray. Netflix is tipped to remain Latin America’s largest pan-regional SVOD platform “by some distance”, with an expected 23.99 million paying subscribers in 2023 – or half the region’s total. Combined, Netflix, Amazon Prime Video, Blim, Movistar Play, Claro Video, Crackle and HBO are expected to account for 91% of the region’s paying SVOD subscribers by the end of 2023. Total over-the-top TV and film revenues are expected to climb from US$2.47 billion in 2017 to US$6.43 billion in 2023, with 83% of the regional total coming from the top five countries. 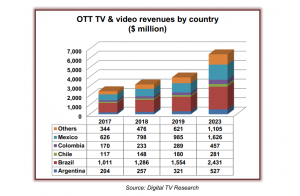 SVOD is expected to remain the region’s largest OTT revenue source, contributing US$4.42 billion by 2023.